Speaking on American talk show, Live with Kelly and Ryan, Victoria said it was an ‘honour’ the fashion-conscious Duchess chose to wear her clothes. She said: "She looked so beautiful. It was such a lovely surprise to wake up to on Christmas morning. "You know, I think she's such a beautiful, strong and wonderful woman - so it was a huge honour." Meghan stepped out wearing a top-to-toe navy ensemble, opting for a £1,250 v-neck knitted sweater dress from Victoria's Pre-Fall '18 collection and following the designer's online recommendation to pair it with boots. The duchess teamed it with a pair of classic knee-high boots from the range, priced at £1,250 and competed the look with a quirky box bag complete with internal mirror, costing £1,550. Meghan completed the look with a matching £2,250 coat from the collection. The newly-married Duchess has previously spoken about how she chooses her outfits and has said before: "What I'm starting to learn is, even though things look amazing on the hanger, it doesn't mean they're going to look amazing on me. 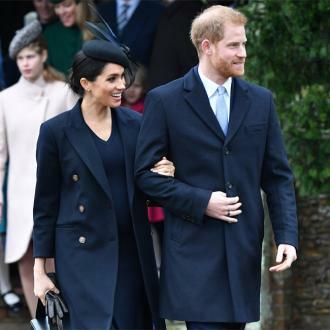 But following her appearance in the designer's clothes, celebrity stylist Lucas Armitage told Femail that the changes Meghan's body is going through during her pregnancy means she is able to wear pieces she previously would not have felt comfortable in.